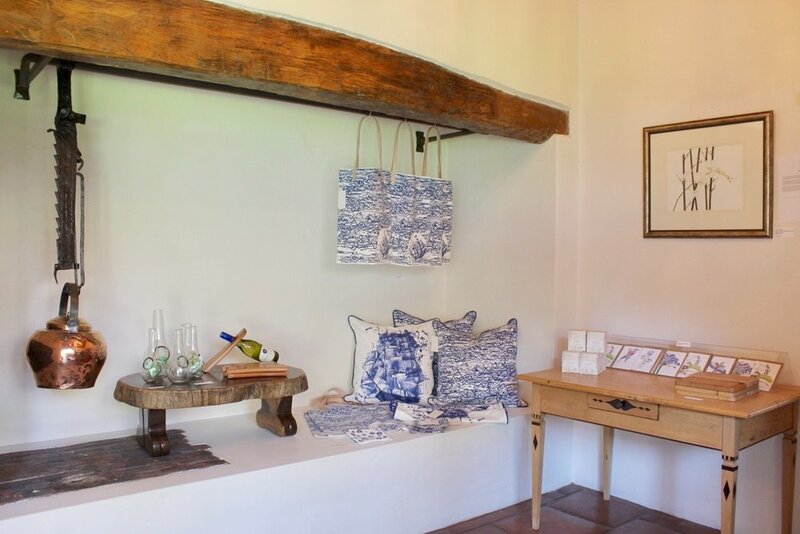 We sell a range of high quality, locally designed and made goods from bespoke fabric items and mohair, to ceramics and sculptures, handcrafted wood, smalls and high end safari style furniture. New products arrive on a regular basis. Why not visit our showroom at 23 Killarney Street, Sandton, and stay for a coffee while you're here? Until our online shop is up and running, please drop us an email if you see something you like, and we'll gladly forward you pricing on individual items. One of The Cape Workshop's distinctive leadwood hand-carved bowls. Exclusive lodge and Cape furniture using reclaimed yellowwood and 'rescued' leadwood. In 2008 The Cape Workshop acquired a large quantity of indigenous and protected leadwood, after a farmer in the Limpopo Province (near Botswana) had received a permit to have the dead logs removed prior to a land redistribution process starting. The Cape Workshop makes a range of one-off handcrafted bowls, high quality tables, seating and smalls. Also offering bespoke services. Based in Port Alfred, Eastern Cape. Heino Schmitt Design (HSD) consists of a range of bespoke, handmade, functional art furniture. High quality raw materials are used to create once off design pieces. He uses combinations of wood, steel, driftwood, copper, brass and leather and often surprises by making his designs unpredictable when using found objects. Each HSD piece is unique and gets individually coded tracking the story it tells. It will challenge the appreciators to think, explore and expand their perceptions, leaving them inspired. Jenny Hyde-Johnson's "Bateleurs of Maun" find a very striking place in The Gable's 'Lodge room'. Jenny’s home is in a beautiful World Heritage Site (near the Magaliesberg) which inspires many subjects for her work. Her bird paintings have been exhibited and toured the USA yearly in the prestigious Leigh Yawkey Woodson Art Museum's 'Birds in Art' Exhibitions since 2008. Jenny has received Gold Medals at Kirstenbosch Biennales, her work is in the collections of Leigh Yawkey Woodson Art Museum and the Hunt Institute. More recently, her paintings were selected for Dr Shirley Sherwood's Collection housed at Kew Gardens, London, UK. Boniface, the artist-sculptor behind Unique Driftwood Creations founded in 2008, creates exclusive sculptures using driftwood, foundwood and fossilized/petrified wood. These one-of-a kind art sculptures reveal nature’s own handiwork. He discovers his material from nature’s recycle bin: the river banks of Zimbabwe; the deserts of Namibia; the shores of lakes in Malawi and the coastal areas of South Africa. Boniface exhibits his work at The Watershed in Cape Town and at The Malcolm Bowling Gallery Hermanus. The Gables is pleased to have the exclusive rights to display and sell Boniface’s leadwood carvings. Andre studied Fine Art and majored in Sculpture at Rhodes University Grahamstown and works from home in Bathurst, Eastern Cape. He uses a variety of interesting materials, including indigenous hardwoods, bones, stone and metal served up by our unspoilt coastline and virgin bush. Andre’s sculptures often capture a moment in time or an underwater incident which he translates into movement, rhythm and tension; sometimes he creates mythological figures in flight. His work reflects "a love of inner beauty, exposing the colour, texture and patterns that lie below the surface.” Andre has exhibited at The Everard Read Gallery, The National Arts Festival (Grahamstown), The Opening of the Development Bank of South Africa, Intoto Gallery (2011-2015) and most recently at Stephan Welz & Co Art Studio in Nelson Mandela Square. German-born Klaus Tiedge has been a prominent figure in the field of commercial photography for more than 20 years, having worked in numerous countries including India, Japan, Brazil and the USA. In 2001 Klaus moved to South Africa and settled down in beautiful Cape Town taking full advantage of a thriving fashion industry and optimal conditions that the region is renowned for. In 2008, Klaus decided to shelve his commercial endeavors and pursue his passion for fine art photography as he turned his attention to the beauty and diversity of the African continent. This has leaded him to devote a significant amount of time on safari in various countries in Southern and South East Africa.